Zain Javadd "Zayn" Malik (/ˈmælɪk/ (born 12 January 1993), who records as Zayn, is a British singer and songwriter. He was born and raised in Bradford. Malik wanted to pursue a career in music from a young age leading him to audition as a solo artist for the British reality television music competition The X Factor in 2010. 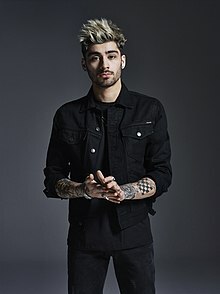 After being eliminated as a solo performer, Malik was brought back into the competition, along with four other contestants, to form the boy band that would become known as One Direction. During his time in the group, they released the albums Up All Night (2011), Take Me Home (2012), Midnight Memories (2013), and Four (2014). Malik split from the boy band in March 2015 and signed a solo recording contract with RCA Records. This page was last changed on 22 February 2019, at 07:32.